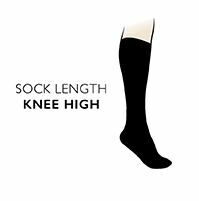 Ladies Thorlos Thick Cushion Ski Socks are US-designed and manufactured to bring comfort to skiers, whether skiing on easy or varied terrain, and who wear rental boots to ensure maximum warmth, protection, comfort and the best possible fit. An exclusive blend of the company's own Thorlon and Thorwick fibres maximise wicking for dry, warm feet, aided by ventilation panels for better air circulation. Deep, dense cushioning at the shin, and in the instep, ball and heel of the foot protects against typical skiers’ complaints such as shin bite and shear, while more moderate cushioning and Spandex targeted to the foot arch improves fit and support.